Mindy has been a member since 2005. Mindy serves as one of our Scout Coordinators. 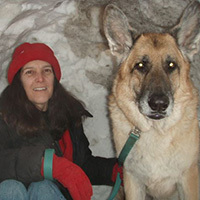 She is a certified Search and Rescue Technician II with training in human and canine first aid, National Incident Management Systems, Hazmat, and Licensed amature radio operator. She is skilled in compass, map reading and navigation.